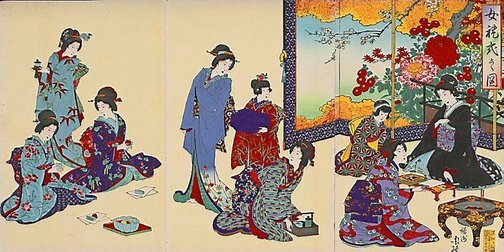 This work is from a fairly well-preserved concertina album which contains eight triptychs by two prominent print artists of the Meiji period, Adachi/Shōsai Ginkō and Toyohara/Yōshū Chikanobu. Except for the first triptych by Ginkō which depicts the Heian period court-lady Murasaki Shikibu, the author of the ‘Tale of Genji’, attending Empress Shōshi, all the other triptychs focus on wealthy, sophisticated contemporary women performing social activities like entertaining guests, gathering for tea ceremony, attending sewing classes or preparing decorations for the five major seasonal festivals. This triptych depicts upper-class ladies in an interior setting: the hostess is about to write something while servants entertain guests with tea and sweets.